Here are Some of the Best Ottawa Pubs and Bars to Check Out! Want to find the best pubs in Ottawa? From Highlander to Pub 101, there is no shortage of amazing places to grab a drink. The best bars in Ottawa are found all over, from downtown to the famous Byward Market. Byward Market pubs are always super popular with locals and tourists alike! Eric has been to Ottawa a few times (and been out in the Byward Market area countless times). Lisa has only been to Ottawa briefly in the winter time (with Eric) and so we didn’t get a chance to bar hop! Let’s just say it wasn’t the best time to visit Ottawa! We need more time to explore Canada’s capital – and we’ll do that in the near future! So, to help us narrow down the best pubs in Ottawa for when you visit, we asked a local friend, Wes, for his input. Born and raised in Ottawa, Wes is a huge wealth of knowledge when it comes to good local places that are worth checking out! Ready to explore the Ottawa pub and bar scene? There’s lots of music, food, and drinks to be had! 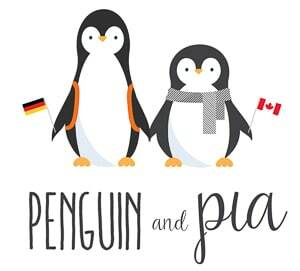 New to Canada? Here are some Need-to-Knows about Travelling to Canada for the First Time! Looking for things to do and see? We’ve got 26 Attractions from Across all of Canada. Want to live and work in Canada? A Working Holiday Visa to Canada might work for you. Need a place to stay in Ontario? Here are Some of Ontario’s Finest Inns! There’s more to explore: Check out other Great Weekend Getaways for Couples in Ontario! Below is a map to show you exactly where the pubs and bars in the article are. As you’ll notice, they are grouped together in bunches that make them easy to hop to if you’re interested in a little pub crawl! On the map one bunch represents the Byward Market area (Red/Pink Martini Icons), while another cluster represents the pubs and bars on the very popular Elgin Street (Purple Martini Icons) – close to the Golden Triangle. Finally, there are a few places located in Centretown (Teal Martini Icons) on this list. As one of the most popular spots to head to if you’re “heading out”, the Byward Market area is always hustlin’ and bustlin’! The Market itself is actually full of awesome shops and stalls. The area around is full of more shops, but mainly bars, pubs, and restaurants for all tastes! Lowertown is definitely a Canadian-style brewery. The cool thing about Lowertown is that they sometimes have a small bonfire on their patio. The other really cool thing: they also have a small pinball arcade! If you are looking for food, you’ll find Canadian classics like poutine and other barbecued goodies. Lowertown’s atmosphere is topped off with weekly live music, stand-up comedy, and people looking to have an enjoyable evening with good people. While the prices are moderate to higher, you can’t beat a local microbrewery with amazing beers and food pairings. Located in the Byward Market area, the Heart & Crown is a class stop on a fun night out. As you might guess from the name, Heart & Crown is an Irish pub – complete with Guinness, Jameson, and other favourites on tap! If you are looking for food, you can expect traditional pub fare. You know, fish and chips, sliders, the usuals. They even do a decent breakfast if you’re hurting after a night out! In the back, there is an area for the live music to take place. The music is bumping almost every night of the week. Eric has actually been here and the live music was incredibly good and lots of fun! Overall, Heart & Crown is moderately priced, the atmosphere is lively and energetic, and there are plenty of good beers on tap. What else do you need?! Taking a page out of the Warehouse playbook (there is one in Toronto, as well), El Furniture is making a splash in any city it finds itself. Located in Byward Market, this place is known for the lineups and the hype. Why? Because every item on the menu only costs $5.75! Yes, seriously. This makes the price range cheaper – perfect for indulging in your favourite foods and drinks. The menu is described as “Canadian” – so if burgers, tacos, and salads are very Canadian then we guess Canadian it is! In general, El Furniture fills up fast on weekends because there’s a great upbeat and energetic vibe throughout the place. Give it a go if you need cheap food and drinks! If you are looking for the best tacos in Ottawa, then you’ll want to head down to El Camino. You’ll notice that there are two locations on the map for El Camino. The original location is on Elgin Street while the second location is in the Byward Market. They have slightly different hours so be sure to check ahead for the location you want to check out! In general, El Camino is a surefire casual and upbeat vibe. For a moderate price range – you can’t beat $4 tacos and great drinks! We can’t talk about pubs in Ottawa without mentioning a classic stop on any Ottawa pub tour. Clocktower is known across the city – no, seriously – there are three locations to choose from across the downtown area! They actually have more across the city – but these are the ones you’d be closest to if you were exploring the centre! Clocktower has the distinction as being the oldest full-service craft brewery in Ottawa. Since 1996, this place has been making people feel at home in their comfortable and relaxed atmosphere. Clocktower is known for their regular and variety fo seasonal beers on tap as well as their extensive food list. From sharing plates to salads to wraps and burgers and dessert – you’re sure to find something you’d like for a moderate price! Another hub for places to eat and drink is along Elgin Street. As one of the main arteries that lead towards the Parliament buildings, Elgin is a great place to start an evening as you inch (or crawl) closer to the Byward Market area! Check out a few of these Ottawa pubs and bars! Located right on Elgin Street in the heart of downtown, The Manx is this super cool subterranean (downstairs) hideaway pub. Inside, the tables are cosy and the place is filled with art and a classic pub atmosphere. The prices aren’t too crazy and you’ll find a pretty decent selection of craft beers and whiskey. The Manx is actually a place that we have been to together with Wes and another friend! Since it was the winter time, we had an Irish coffee and a massive club sandwich. The fries were very good as well! Think classic pub grub – that’s what you find at the Manx. Occasionally, they have live music so check the schedule for which night you want to go! Bearing the name of Canada’s first Prime Minister, Sir John A Pub delivers a classic pub feel. Located right on Elgin Street, you can’t miss this establishment even if you tried to! With a very relaxed pub atmosphere, Sir John A Pub hammers home the pub feel with traditional pub food, decor, and a wide mix (over 50+) of micro-local, imported, and classic draft beers on tap. They even do a weekend pub brunch and a late-night kitchen so if you’re hungry, you know where to go! A little outside the “pub” feel but still noteworthy for the list, Charlotte is definitely an it place to go. Located right on Elgin Street, Charlotte offers guests a very relaxing lounge atmosphere and a sophisticated coolness that you can only find in a handful of places. The entirety of this unique bar is designed to look like a mid-century living room! Their food is a mix of snacks and small plates so don’t expect to get full here – you head to Charlotte for the rotating beers and cocktails made from in-house ingredients. This level of coolness will come at a higher cost, but you can always go for $10 draught flights on Tuesdays. If you want to try a few different beers for a fair price, this is your best shot! Can you really write a post on pubs in Ottawa and leave out MacLaren’s? We don’t think so! Located right on Elgin (you won’t miss it, trust us), MacLaren’s has been welcoming beer enthusiasts and sports lovers since 1997. The place remains a fixture on the corner of Elgin and MacLaren to this day! From the dozens of billiard tables to the many HD-screen TVs around the place, MacLaren’s is a great venue for watching the big game – whatever that might be at the time! It’s a casual sports bar that does pub food like pizza, ribs, classic apps like mozzarella sticks, and so much more. The price is fair and moderate for the experience to watch the game – makes you feel a little spoiled to get such a great bar/pub atmosphere! You might find yourself wandering downtown Ottawa – but if you can’t find Elgin, you might be in Centretown. Located – you guessed it – in the centre of the downtown core, there are a number of great pubs and bars in the area. Below are two that come highly recommended by our local! Looking for an all-around outstanding experience? Consider heading down to Union 613. Located on Somerset Street, this convenient downtown location is filled with amazing cocktails and Southern-inspired dishes like fried chicken! The vibe is definitely classier and more hipster – and the prices reflect an upscale experience. However, the food portions are good and the food is locally-sourced so you’re supporting local businesses here! They even cover all meals (including a late night menu). The main floor of Union not doing it for you? Then head downstairs and behind the shelf to access the tiny speakeasy. Although there is limited seating, you’ll find great cocktails being served up in an interesting, grotto-like wooden basement. But, keep that knowledge quiet – will ya? Playing up the old-time wooden interior and gastropub vibe, Prohibition Public House is a great stop if you’re in the area. Located on Somerset Street, this classy establishment has made a name for itself serving up classy cocktails, local craft beers, and upscale pub eats for years. Inside the house, you’ll find Canadian style cuisine – from charcuterie and shared plates to salads and full-on entrees. The price can be a little on the higher side but the quality of the food and the local beers make the experience worth the price and the trip! 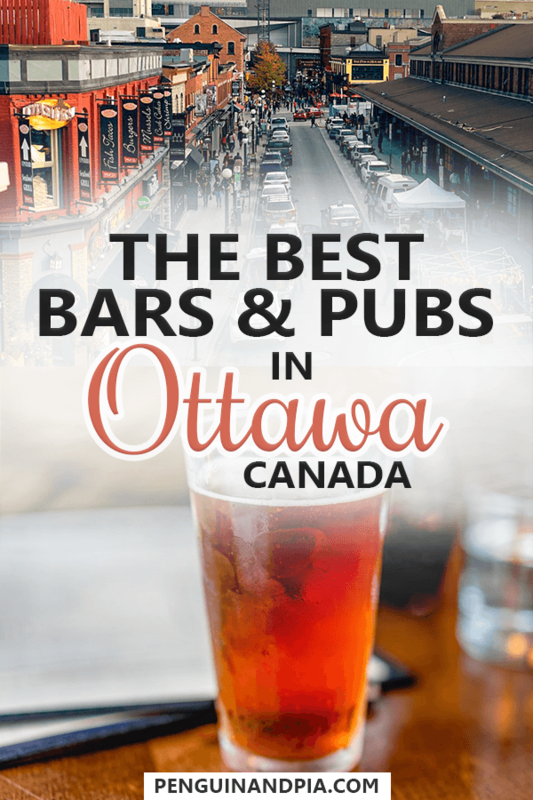 And there you have it – some of the best Ottawa pubs and bars in the city! Of course, this is just a short list. There are just so many places that you can check out – we couldn’t include them all! Where do you like to go when you’re going out in Ottawa? Get in touch and let us know! A huge thank you to Wes for sharing his Ottawa knowledge – your next pint is on us when we see you, Wes!